These little numbers should be outlawed because the smell emanating from the oven alone will make you crazy. 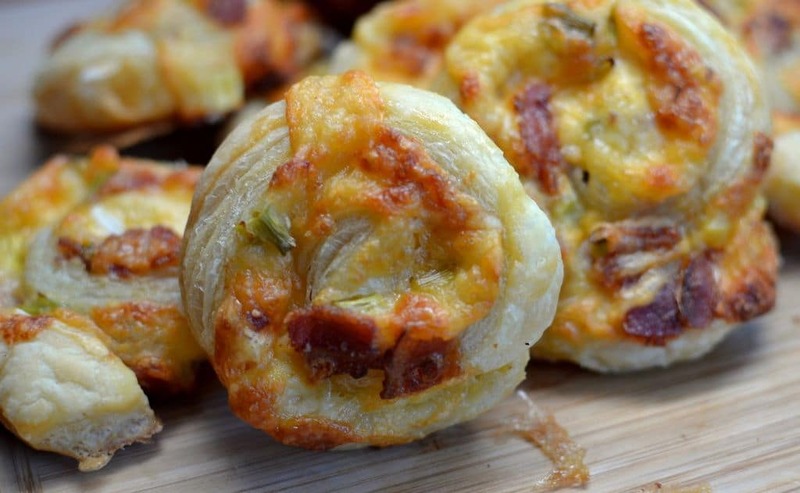 Look at that delicious little critter covered in cheese & bacon. Now I started this recipe with ten but now there are only nine? What the heck!! Where are these going? You won’t be able to resist either! Uh oh now there are only eight! What the heck!! There will not be enough to share with the others! Dang it! 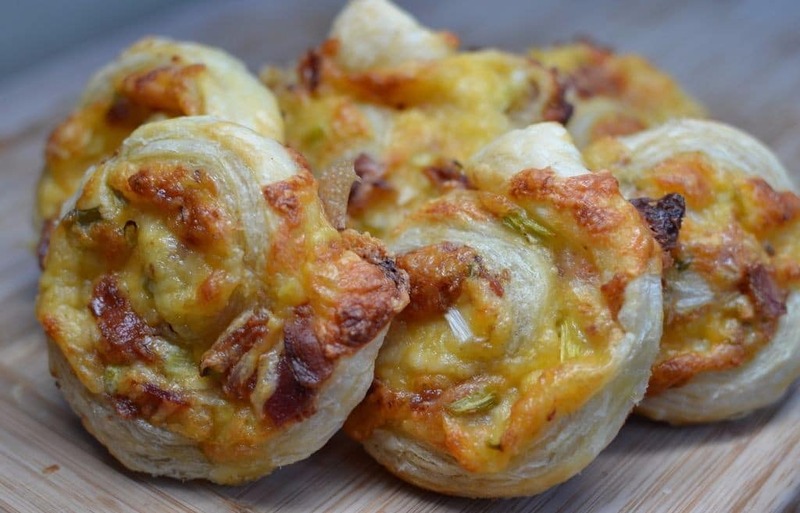 You will not be able to resist the three cheese & bacon combo! Enjoy my food loving friends because I know I will! Thaw puff pastry at room temperature until easy to handle; approximately 40 minute. Whisk egg and water in small bowl and set aside. 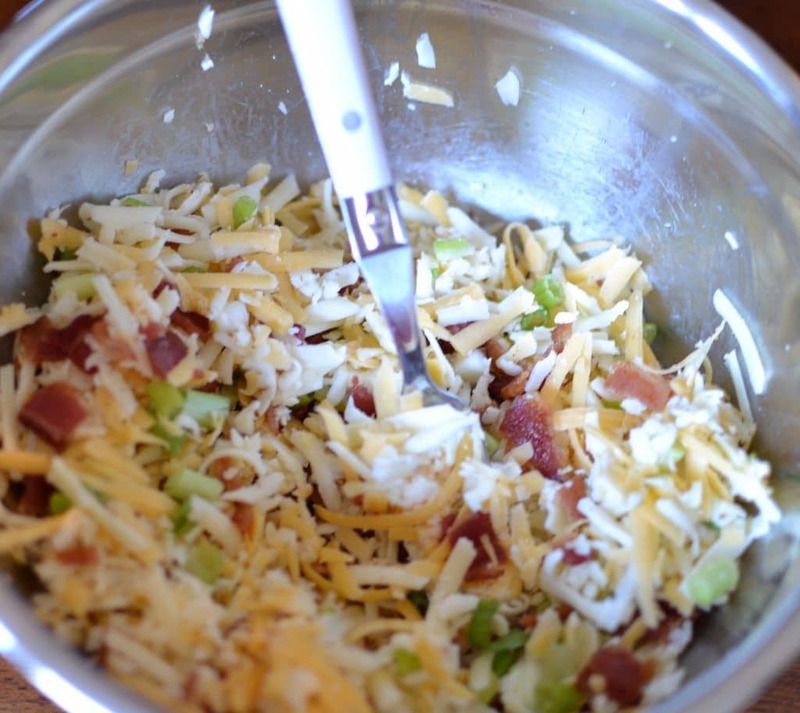 Combine green onions, bacon, cheddar, mozzarella, Monterey Jack and garlic powder in medium bowl. Unfold pastry sheet on lightly floured surface. Remove parchment paper. 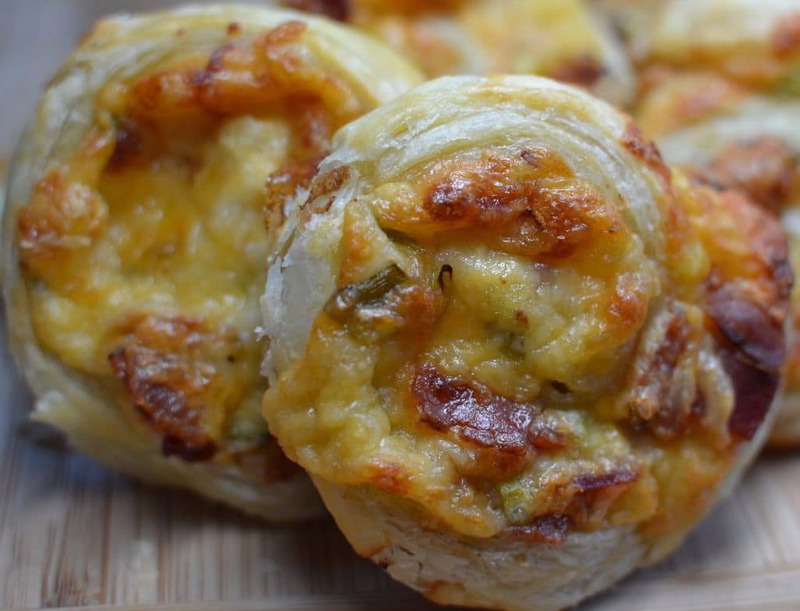 Top with cheese mixture. Starting with the short side closest to you; roll up like a jelly roll as tight as you can. Cut into 1″ pieces. Lay flat on lightly greased baking sheet. Brush with egg mixture on sides and top. Bake at 400 degrees for 25 minutes or until golden brown. Serve warm. These look delicious. Can they be made the day before and cooked when needed or cooked ahead and warm up to serve? These hold up for a few hours uncooked but not a whole day. That is too long when using pastry dough. These little critter taste best when baked fresh. A couple of hours is all I would advise. Happy Cooking!! If you rolled it long ways, wouldn’t you get more pinwheels? Or is there a specific reason why you roll it short side? I just want to make sure I do it right. Thank you, this sounds so good! You know either way is fine. Pastry puff is almost square. I did however want you to roll it up from the short side. 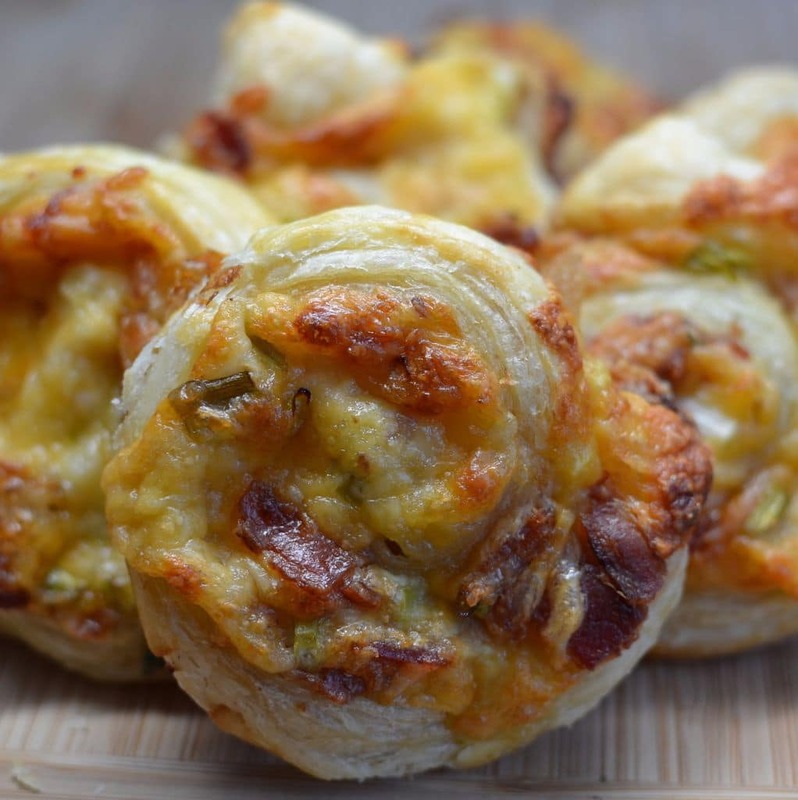 What would you think about using the pilsbury cresent rolls instead of the pastry? I know it would be more breading but do you think it would work? Yes I certainly do think it will work! Yum! How many does each batch make? Thanks! Sorry about the delay. I was out shopping for kitchen appliances. No I think I would lower the oven to 350 to 375 and start watching closely after about 12-15 mimutes.